PR stunts are a brilliant way to show off your latest product and to get your brand noticed. People remember them; they always incite emotion and sometimes cause controversy. Car manufacturers in particular are always looking for new ways to launch their newest model and to make sure their brand leaps out and sets them apart from the competition. These are some of the biggest and the best publicity stunts by car makers. Most people could only lust after the C-Class Coupe when it was unveiled by Mercedes-Benz, so the German manufacturer launched an online competition for people to win one. Their Escape The Map interactive game used Google Streetview to effectively ‘trap’ people inside a map. To escape it you had to find a mysterious portal using clues and the C-Class Coupe sat nav. The quicker you got out, the more chance you had to win a car. Citroen took a similar approach to Mercedes for their DS4 by instigating the biggest game of hide and seek. There were around 700,000 virtual DS4s hidden across the country and whoever found the most - either online through Facebook or in real life using the phone app - won themselves the car. MINI Cooper: causing a storm. MINI wanted to promote how weatherproof their Mini Cooper Roadster was by naming a weather front after it. The ‘Cooper’ weather front could be tracked online by fans and gathered loads of interest. However, the German brand got a little more than they bargained for as the cold front brought massive amounts of snow and freezing temperatures to central Europe, killing around 100 people in Poland and Ukraine. Chevrolet: flipping a Sonic in the air. Chevrolet sometimes has its work cut out when it comes to global promotion. It’s a massive brand in America, but the rest of the world doesn’t quite get it, so they need some serious PR to get the World talking. The Internet was the perfect platform for their 2012 stunt where action sports legend Rob Dyrdek modified a Chevrolet Sonic to turn it into a stunt racecar. 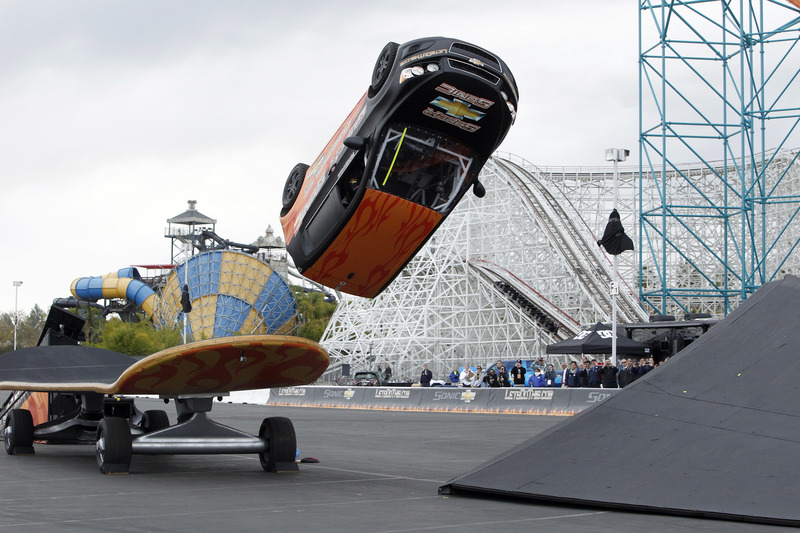 The Chevrolet Sonic was placed on a racetrack and in the middle of the track was a huge kick-flip ramp, designed to make the car flip in mid-air. The flip was successful, the crowd went wild, and the video went viral. Lamborghini: police drive their dream car. To promote their supercar globally, the exclusive Italian car maker Lamborghini gave their Gallardo to the Italian police force to use. The company even trained the police how to drive the 560bhp supercar and it hit the headlines and got the world talking. Honda: skydivers spell it out. Honda have created some of the best car adverts around and their slick, no-nonsense brand is loved the World over. But when Honda wanted to cause a buzz for its new Accord, they went super creative. Taking a team of skydivers, they spelled out the Honda logo in the sky and showed it live on TV.